Laparoscopic pyeloplasty offers a minimally invasive alternative for the management of ureteropelvic junction obstruction that duplicates the surgical principles of open pyeloplasty. The laparoscopic pyeloplasty can be performed by either retroperitoneal or transperitoneal approach. 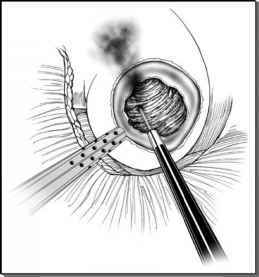 Laparoscopic pyeloplasty was first reported by Scheussler et al. in 1993. It offers a minimally invasive alternative for the management of ureteropelvic junction obstruction that duplicates the surgical principles of open pyeloplasty. Numerous studies attest to the superior long-term efficacy of laparoscopic pyeloplasty over the various methods of antegrade and retrograde endopyelotomy. Prior to the advent of laparoscopic prostatectomy and the need to perform a vesicourethral anastomosis, the most technically challenging reconstructive laparoscopic procedure was pyeloplasty. As such, the surgeon must be well versed in laparoscopic suturing techniques to perform pyeloplasty. The retroperitoneal approach offers the advantage of less potential postoperative ileus, but has the disadvantage of a limited working space. Conversely, the transperitoneal approach offers familiar anatomic landmarks and more working space, but more bowel manipulation, and therefore higher likelihood of ileus. Choice of anatomic approach is dictated by surgeon experience and training. Various techniques for pyeloplasty are described. These can be divided into dismembered and nondismembered techniques. The dismembered or Anderson-Hynes technique involves division of the ureteropelvic junction and excision of the narrowed segment, followed by reanastomosis of the ureter to the renal pelvis. The two common nondismembered techniques include Foley Y-V plasty and Fenger pyeloplasty. The Foley Y-V plasty consists of incising through the narrow segment and advancing the apex of the "Y" incision as a flap to bridge the previously narrowed segment. The advantage of this approach is its relative simplicity. The even simpler Fenger pyelo-plasty involves horizontal incision through the narrowed segment closed vertically in a Heineke-Mikulucz fashion. Other techniques such as the Culp-DeWeerd pyeloplasty have also been reported, but are not among the commonly used techniques. The nondis-membered techniques should not be used when crossing vessels are encountered or reduction of a redundant renal pelvis is anticipated. The technique chosen depends on the task at hand. In general, when a crossing vessel, redundant renal pelvis, or coexisting renal calculi is present, the dismembered pyeloplasty is preferable. Due to the inherent complexity of laparoscopic pyeloplasty, new technology has been introduced to facilitate the procedure. Hand-assisted laparoscopy has been described as a means to assist laparoscopic pyeloplasty. In this fashion, one-handed surgical tying can be performed intracorporeally. Furthermore, surgical robots can be employed to assist with suturing. Whether or not you use technological assistance, the technique remains essentially the same.